The award-winning airline has quickly grown to become third largest carrier at Gatwick and has flown around four million British leisure and business passengers direct to more than 40 destinations in the past year. While Norway is outside the EU, the carrier now has a UK Operating Licence and has applied for a Foreign Carrier permit with the US Department of Transportation, which would allow it to combine services to and from Europe with long-haul flights to global destinations including Asia, Africa and South America. From the South Terminal at Gatwick, the airline flies to eight US gateway airports – Boston, Fort Lauderdale, Las Vegas (from 31 October), Los Angeles, New York JFK, Orlando, Puerto Rico and San Francisco. It offers a very basic low-fare Economy Class (bring your own sandwiches, book cabin dining on-line, or take a chance on what’s on offer), and what it calls Premium, a very competitively-priced Economy Plus product with a novel approach. Norwegian has ambitious plans to locate more than 50 new Dreamliner aircraft at an expanded Gatwick, if the airport is granted a second runway. BTN flew Gatwick to Los Angeles (LAX). On time both ways and 11hrs plus in the air. Taking Monday 31 October as a standard (as of Saturday 23 July) here are some Economy Plus return fare comparisons bearing in mind that Norwegian operates from Gatwick rather than Heathrow: Norwegian (£732.50), Air New Zealand (£1,484), British Airways (£1,216), Virgin Atlantic (£869). Travellers will appreciate that they are “Premium” with Norwegian and treated as such, whereas with BA you are “Third Class” on many routes. British Airways' codeshare partner American Airlines on LAX non-stop does not offer Premium Economy, nor United Airlines, which also serves Los Angeles from Heathrow. There is one area where DY easily leads all the other carriers offering an upgraded Economy Class service. Passengers have a 46in seat pitch which are semi-reclinable. The layout is 2+3+2, with the cabin holding just 32 seats served by two cabin staff and a pair of restrooms. Air New Zealand comes the closest with 42in and a very fine, but more expensive, product, and fewer enhancements. Norwegian offers dedicated check-in, a fast-track pass, priority boarding and use of executive lounges. At Gatwick, it is the excellent revamped No 1 Traveller offering, and at LAX oneworld’s really top-quality Qantas-operated Business Class facility. Perhaps most important of all, DY flies the Boeing 787-8 Dreamliner, with its large dimming windows and 6,000ft cabin pressurisation, 14% cabin humidity (as against 7%). It is easily the least-demanding aircraft for a long-haul flight, with the exception of some carriers’ Business Class A380s. The luggage allowance is 2x20kg and plenty of overhead bin storage space, with a USB charger and power outlet by your seat. On boarding, free soft drinks are served and the cabin staff are more than happy to place jackets in a wardrobe. Video screens come out of the seat arms and there is a good selection of films available but no news service (nor wi-fi – a courtesy feature of Norwegian’s European flights). The foldaway table is sturdy, but there is a lack of storage space except in the seat back. The cabin design is bland and the way the meals are served likewise. There was a choice of four three-course menus but these are offered complete in a single plain box. For just a few pence, these could be made more attractive with perhaps a destination design on the cover. It is not a plated service, nor given with any style, and while Premium is the bold word used, we are talking about an uprated Economy product. Nicely-presented steak, chicken breast and salmon were on offer plus a vegetarian concoction. It is plastic cutlery, the meat proving no problem. One gets peckish on a long flight but Norwegian does not offer any courtesy refreshments between meals and Premium customers have to pay for drinks outside the two eating sessions. This is a small drawback, but the airline is still learning about long-haul and once again for a modest cost should be included. 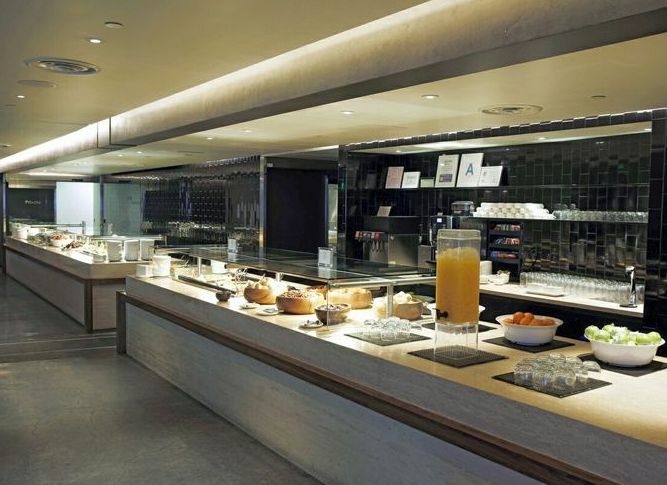 The Snack Bar menu varies from sandwiches, salad, crisps and cakes to drinks and duty-free items and is essentially for customers in the rear cabin. You just pick an item you would like to purchase, via your seatback tv screen, swipe your credit card and your extra food gets delivered straight away. If you want to view the free films offered, bring your own noise suppression headsets. The ear pieces supplied in Premium (€3 at the back end) are virtually useless. Departure was on time at 14:10 with the meal coming up quickly. We were served afternoon tea about 90min before arrival. This consisted of a warm bagel with smoked salmon, cream cheese, tomato, onion and lettuce, along with a side of capers. Very nice, and with a courtesy bar plus tea or coffee in a cardboard cup. No complaints on landing regarding US immigration and customs. We were straight through in minutes with the luggage just as quick. It was much the same for the return journey, with departure at 19:30, ideal for a fine buffet meal in the Bradley Terminal lounge before boarding, supper treated as a late-night snack and then sleep. No complaints with the cold breakfast, but a courtesy snack and drink taken sometime during the night would be welcome. 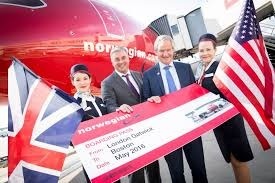 The Norwegian Air LAX service is not daily yet, but with high load factors and the Gatwick catchment area (which includes virtually the whole of London), passengers are beginning to appreciate what the airport offers. In terms of upgraded Economy, Norwegian long-haul is quickly establishing itself with travellers who do not want the ‘back end’ and whether on business or pleasure cannot really reach out to the fares charged by legacy carriers. In virtually every respect it is better than the competing products, and at cheaper prices too. Value added, it also offers a very easy passage through what can be an exhausting airport. And shortly to eight US destinations. We will fly Norwegian Premium again. I have flown Norwegian quire a number of times in Europe and think they are very good. At the end of March my wife and I flew premium economy from Oslo to LAX. We did not think that the seat was at all comfortable, and yes the issued earpieces were useless. The airline makes great play about the Windows on the 787 and how good they are. As a serious photographer I was looking forward to taking photographs in the clear skies over Greenland. Not possible. Passengers had no control of the window setting as the cabin crew had put them on dim the whole flight - not impressed ! I have flown the 786 with other carriers where the passenger can choose the window setting themselves. Also on return from LAX to LGW there were very long queues at security. Why ? Because only half of the positions were manned ! Not the fault of Norwegian. But with the window issue I cannot see me using their 787s again.